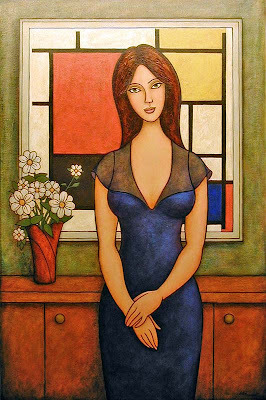 A painting from 2004 of a girl standing in front of a print by the Bauhaus Artist Piet Mondrian. There is nothing better than a beautiful woman, and beautiful art together at the same time. I saw this lady at a party standing in front of this painting, and I knew this was a work of art. I came home and immediately began to paint this picture. There is nothing like sharing a good wine and conversation with a special friend. 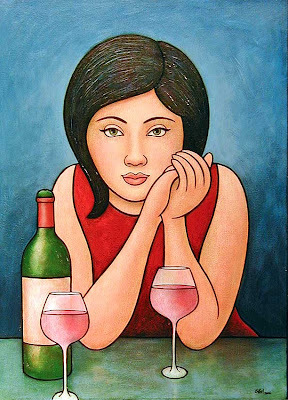 My idea behind this painting was to invite the viewer to the table engaging in conversation with the beautiful model. She listens intently as you speak.